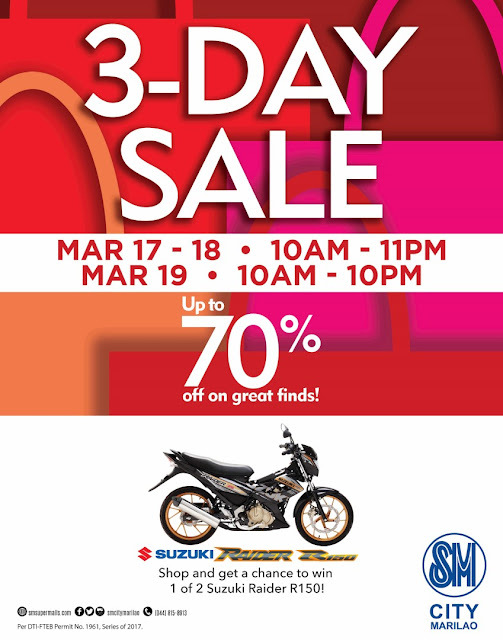 It's another 3-DAY SALE at SM CITY MARILAO. Enjoy another big blowout shopping experience on March 17, 18, and 19, 2017. Expect up to 80% discount on items mall-wide. Bargains include items from SM Department Store, SM Hypermarket, Ace Hardware, Our Home, Toy Kingdom, Watson’s, Miniso, SM Appliance Center, and at over 200 stores at the mall. As an added shopping treat, SM Prestige card holders on March 17 will enjoy a whole day of extra 10% off at The SM Store and other participating mall affiliates. SM Advantage Card holders can also indulge in shopping frenzy as additional 10% off on top of the given discount will be offered from 9AM-12NN on March 18 at participating SM anchor stores and affiliates. The surprises do not end there because lucky shoppers may win 1 of 2 Suzuki Raider R150 during the 3 day Sale raffle promo. Joining is easy. Every P1000 single or accumulated purchase from any mall establishments entitle shoppers for a raffle coupon and a chance to win in the 3 day sale raffle promo. Shoppers may present their receipts at the designated redemption booth. Also, don’t forget to discover amazing dinning selection at affordable prices at the SM Foodcourt. Mall hours will be from 10AM- 11PM on March 17 and 18, and 10AM to 10 PM on March 19. Snag the best deals and bring home loads and loads of goodies for you and your family! Enjoy loads of shopping rewards and bargain hunt only at SM City Marilao’s 3 Day Sale! For more updates please like them on Facebook.